Texas is quickly emerging as a top destination for retirees. In fact, a recent study conducted by the North Carolina Center for Creative Retirement noted that Texas has surpassed California and Arizona to claim the number two retirement destination in the country behind Florida. While there may not be as many 55+ active adult retirement communities in Texas as in other states, there are certainly a lot of draws to the state. As the influx of retirees moving to Texas continues to grow, homebuilders are taking notice and the number of 55+ active adult communities in Texas has steadily grown in recent years. Texas is the second largest state in the nation based on both population and area and is often referred to as the Lone Star State." Three of the most populated cities in the United States are in Texas, which include Houston, Dallas and San Antonio. Retirees are drawn to Texas for the mild climate and wide-open spaces. Because of the large size of the state the topography varies from mountainous to forested hill country to coastal plains and prairies in the interior. There are many mountains, rivers and lakes found throughout the state of Texas. Due to the state's location, it has multiple climate zones. Most areas of Texas have consistent high temperatures in the summer months. The Gulf Coast experiences a maritime climate, whereas inland it's more continental, drier in the west, and wetter along the eastern border. Hurricanes and tornadoes are not uncommon in Texas. Spring is typically the best time to visit between February and April when the humidity is low and the days are warm and sunny. Most people associate Texas with an image of a cowboy and the motto Everything is bigger in Texas. Texans follow this motto and tend to be larger than life and accepting of everyone making the state a huge melting pot of many cultures and lifestyles. Texans love their history and take pride in their state. There are many popular attractions in Texas for active adults and retirees including The Alamo, Houston Space Center, State Capitol, Paseo del Rio, Galveston Island, Gruene Hall, Natural Bridge Caverns, Cowboy Stadium, Big Bend National Park and much more. Austin is considered the live music capital of the world. Texas is best known for petroleum and natural gas, agriculture, steel, banking, insurance and tourism. The state leads the nation in livestock and cotton production. Texas has more farms than any other state as well as the highest acreage. Texas is also home to more Fortune 500 companies than any other state including AT&T, Dell, NASA and Men s Warehouse. Texas is one of the most business-friendly states in the United States with low taxes, low cost of housing and high quality of education. Active adults appreciate that real estate prices are among the lowest in the country. 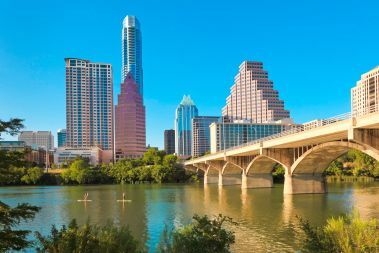 Most large metropolitan areas in Texas enjoy prices that are below the national average and some places in the state are as much as 20 percent below the national average. The reasonable prices and open spaces have attracted many retirees in recent years. In addition, many retirees are drawn to Texas by the fact that there is no state income tax. However, be aware that the overall tax burden in Texas is one of the highest in the country. In fact, in the 2008 book, Americas Best Low-Tax Retirement Towns, five cities in Texas fell into the "Tax Hell" category. Active adults and retirees are fortunate that Texas is home to 583 hospitals and has some of the best medical centers in the country. The state is one of the largest faith-based nonprofit health systems in the US. The citizens of Texas take fewer mental health days per month than average and the state has a low rate on cancer deaths.